LaGuardia Airport Parking Your car can pay for your parking space. LaGuardia Airport Parking : LaGuardia Airport (LGA) is situated in one of the largest, active and lucrative cities in the United States of America. New York City has one of the craziest vehicle traffic on roads leading to airports. Accessing LaGuardia Airport is in itself a huge task, so is the airport parking. Parking at New York City demand wit, punctuality and a proper strategy. Avoid the headache that comes with securing a parking spot in the City and its environs by signing up with TravelCar Rentals and Ride-sharing Facility. Not only are you assured of a parking spot in LaGuardia Airport, but also the surrounding cities, seaports and train stations. TravelCar gives clients discounted airport parking at LaGuardia Airport. Valet parking rates are also discounted if you make your bookings early enough. Other services available at TravleCar’s parking lots include car interior vacuuming, car polish buffing, car waxing, spray and hand car washing. We also provide wheel alignment, tire serving, engine servicing and extra car detailing. Contact us via phone on +1 888-807-0209 to book any of the services mentioned above. 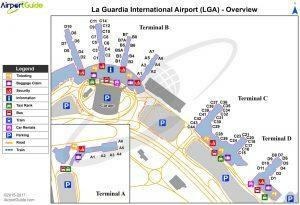 LaGuardia Airport is in Queens County, New York City, U.S.A. It neighbors Jackson Heights and Astoria. LaGuardia Airport evolved from a private airfield called Glenn H. Curtis Airport which was constructed in 1929. The airport has changed names from Glenn H. Curtis Airport to New York Municipal Airport- LaGuardia Field and finally to LaGuardia Airport in 1953. New York City owns LaGuardia Airport. LaGuardia Airport is number 21 in ranking among the busiest U.S international airports and the second major airport in New York. LaGuardia Airport seconds John F. Kennedy International Airport in total passenger boarding as per 2017 airport statistics. The Port Authority of New York and New Jersey handles operations at LaGuardia Airport. LaGuardia is a primary hub for American Airlines and Delta Air Lines. The New York Metropolitan Area depends heavily on LaGuardia Airport for commercial airline services. LGA sits on 680 acres of land in East Elmhurst, Queens, New York City. It has two runways, four terminals, and 88 gates. LaGuardia Airport has daily parking slots at Terminals A, B, C and D. There is also an option for Premium Reserved Parking and Parking for People with Restricted Mobility. The B Wait Area allows free parking for a maximum of three hours. We are located off the airport grounds, about a ten-minute drive from the airport terminals. Our shuttle service is free and ferries clients to the terminals on a frequent basis. The shuttles are comfortable and ADA compliant. This means that even disabled individuals can benefit immensely from our shuttle services. Our parking area is gated and well equipped with CCTV video surveillance. Guards are on standby to provide security and direction to clients where necessary. Access covered parking slots and get a nice car wash and car detailing for your automobile. TravelCar offers parking services at various large and medium airport hubs. Many international airports in the United States of America experience parking shortages due to the influx of vehicles. We are often situated offsite to provide convenient parking arrangement. Below is a list of renown airport hubs in the U.S.A that we provide discounted airport parking services. The following are city centers in small towns in the New York State that neighbor LaGuardia Airport. Access cheap parking solutions from TravelCar at these downtowns. Some cities in New Jersey are also proximal to LaGuardia Airport. The cities include Union City, Edgewater, North Bergen, Ridgefield, Fort Lee, West New York, Hoboken, Fairview, and Guttenberg. There are numerous benefits that you as a traveler stand to gain from choosing us as your parking space and car rental provider. We have an elaborate plan of facilitating transport to LaGuardia Airport from our wide fleet of car rentals. You can select the car of your choice from New York City and drive to LaGuardia Airport. You can drop off the car at TravelCar’s parking slots and proceed to your flight. In the case where you are driving a personal vehicle to the airport, you can either opt for valet parking or self-park at our parking spots. When you are booking online for the service, kindly specify if you need valet parking so that one of our valet attendants can pick your car at the terminal’s curbside. Choose any car maintenance service that needs to be undertaken in the parking area. Please note that we offer basic and high-end car maintenance services at our parking slots. We conduct engine servicing, battery servicing, and wheel servicing. Car wash and car detailing are also available. Give your car a nice polish at a reasonable rate. Travelers with electric vehicles can drive to any of our charging stations, leave it to one of our agents to oversee charging to completion. Do not be swayed to believe that valet parking is only for the elite travelers. TravelCar seeks to avail valet parking services to all travelers to ease their travel burdens. For a low price, get valet parking and discounted airport parking at LaGuardia Airport. Book in good time on www.travelcar.com for valet parking. The service is available 24/7 and is offered by a team of professionals. Enjoy 24/7 customer support from our courteous customer service agents on all our communication platforms. Our team is ready and willing to answer all questions pertaining to our services, locations where you can get our services, hours of operation and the booking process. Reach out to us on Facebook, Twitter, LinkedIn and on the phone to address your comments and concerns about our service. Always remember that TravelCar is one of the leading providers of discounted airport parking services. Trustpilot ranked TravelCar high with a score above nine in the list of excellent transport service providers. Road Airport Shuttle Bus from the Port Authority The Airport Shuttle Bus provides transportation from LaGuardia Airport to The shuttles operate during the day only. Access LGA from the West side through Interstate 78. Head Eastwards to the New Jersey Turnpike and drive through Exit 13. Go over the Goethals Bridge and drive on Staten Island Expressway (Interstate 278). Proceed to Verrazano Bridge and drive Northbound on Gowanus Expressway to BQE. Use Exit 38 on the Northern Boulevard. Drive Eastwards to the 9th Street and proceed to LaGuardia Airport. Follow the following routes from the Eastern side: Interstate 495 (Long Island Expressway) Westbound, Interstate 278 (Brooklyn Queens Expressway), BQE Northbound, Northern Boulevard/Exit 38 Eastbound, 94th Street Northbound to LaGuardia Airport. If you are coming from the Northern part, use the routes: Interstate 87, New York Thruway Southbound, Major Deegan Expressway, Triborough Bridge, Astoria Boulevard Eastbound, 94th Street Northwards, head left to LGA. The following roads from the Southern side will lead you to LaGuardia Airport: New Jersey Turnpike Northbound, Exit 13, Goethals Bridge, Staten Island Expressway, Verrazano Bridge, Northern Boulevard, 94th Street, proceed left to LGA. To avoid missing your flights, you may need to leave a few hours before your flight.